Garrison66.com | The Southwest Missouri Chapter of The 501st Legion. Our mission as a Garrison is to represent The 501st Legion; spread the love of Star Wars, sci-fi, and the art of costuming to fans of all kinds; and increase awareness of costuming in every corner of our territory as well as those remote territories that we visit while combating the forces of the Rebel Alliance through massive acts of selfless charity. We have raised thousands of dollars for local and national charities. See what we are doing on our Facebook page. GARRISON 66: THE TEMPLE RAIDERS is a unit comprised of 501st Legion members in 20 counties of South-West Missouri. Our name is derived from the presence of Historic Route 66 within the garrison territory. It also serves as homage to Order 66, the infamous command that started the legendary Jedi purge. The 501st Legion is a worldwide Star Wars costuming organization comprised of and operated by Star Wars fans. While it is not sponsored by Lucasfilm Ltd., it is Lucasfilm’s preferred Imperial costuming group. Star Wars, its characters, costumes, and all associated items are the intellectual property of Lucasfilm. For more information contact us here. ©2014 Lucasfilm, Ltd. & TM. All rights reserved. Used under authorization. 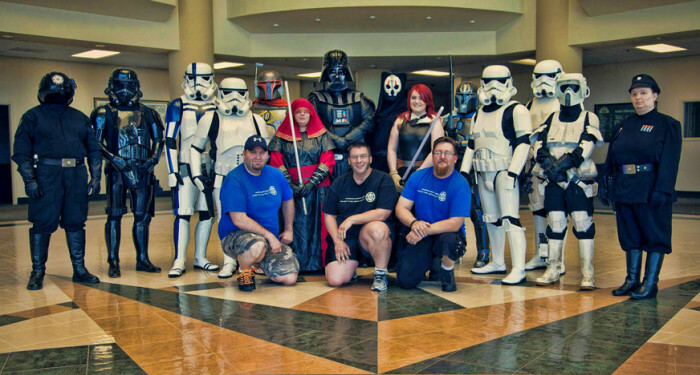 Here is a link to our active member page on the 501st website.